With 2018 now in full swing, architects and interior designers are ready to take their party hats off and get their thinking caps back on to bring a new wave of innovation to the world of apartment design. As experts in this space, we have a few hunches, 7 in fact, of what’s going to be stealing the spotlight this year. Kitchens and bathrooms are expected to become even more minimalistic this year, with flush, soft-closing cabinets, large-format tiling on floors and walls and a narrow, sophisticated colour palette. 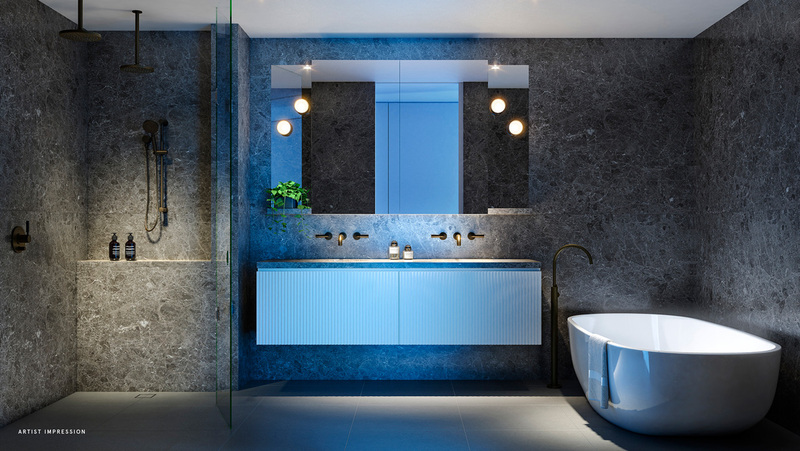 However, the trend of including an exotic, textured and standout element – for example in the kitchen splashback or shower recess – began last year and shows no sign of stopping. Another kitchen and bathroom trend on track to explode this year is eccentric tapware. Brass taps and showerheads reminiscent of a bohemian Moroccan riad are set to make an appearance as the alternative to the standard polished chrome. Even kitchens dotted with distinct features (like a marbled splashback and brass taps), can achieve a sense of unified cohesion. This is best achieved by ensuring cabinets are dominant in the kitchen’s design and palette, hiding appliances like the fridge and dishwasher, which usually disrupt the seamless aesthetic. Camo kitchens are the preferred choice for the artists bringing culinary dreams to life in 2018. We’ve come a long way from fluorescent tube lighting, but the journey isn’t over. Spotlights embedded in ceilings are losing their appeal, and bespoke feature lighting that serves its functional duty as well as posing as an art piece is set to dominate this year. There’s nothing quite like an open flame to set the mood for a cosy evening at home. But lugging around firewood, building fires and dealing with smoke and ash are not on anyone’s to-do list for 2018 – certainly not inside a beautiful new apartment. Electric fireplaces eradicate all of the annoyance and deliver all of the ambience, and interior designers have taken note. Sliding doors across the breadth of the bedroom that neatly hide away wardrobes are nice, but it’s walk-in wardrobes that are in vogue this year. Ergonomically positioned between the bedroom and the ensuite bathroom, this dedicated space that you can step inside to make your daily fashion decisions is the ideal scenario. Having a nice view to enjoy from your living room or balcony is pretty standard by now. But why should the beautiful backdrop stop there? 2018 promises to be the year that bedrooms are given the benefit of expansive glazing so that you can fall asleep to the twinkling city lights or wake up to the lush suburban landscape. With so many great interior design trends to look forward to in 2018, it’s the perfect time to be buying an off the plan apartment. Discover our full range of NSW apartments and VIC apartments here.